Geek Lit Etc. : Manga Monday: It falls onto one dumb High School kid to save the world? Again? Manga Monday: It falls onto one dumb High School kid to save the world? Again? Some guys are just destined to have bad luck. Ranma Saotome is a good example. Most people would thank that having dozens of people falling all over themselves to be with him a good thing. But when those people include both genders, and all are martial artists, love spats can get a little out of hand. Tanaka-san from Neko Ramen would be another good example of luck gone horribly wrong. Somehow, he's become involved with this terrible ramen stand, and everything he does to get a decent lunch, including trying the new curry restaurant in tow, is in vain. Ataru, though, probably takes the cake, in Urusei Yatsura Volume 1. When an alien race chooses Earth to invade next, it uses a computer program to pick Earth's one chance at salvation. Out of 6 billion people, the Oni's computer picks Ataru Moroboshi, a luckless, lecherous, rather dumb High School student from Japan. But even though Ataru is dumb, and even though it takes his girlfriend agreeing to marry him if he wins, it's still just a dirty trick that gets him the win to save the Earth. And yet, he can't seem to get that right, either. For when he tells his girlfriend Shinobu that he'll marry her, the alien Lum that he's been trying to catch thinks that he's proposed to her. And she promptly accepts his proposal. So now Ataru has a very angry girlfriend who he'd intended to marry, as well as a green-haired alien babe in a tiger-striped bikini calling him Darling. And hitting him with lightning bolts when she gets mad. The worst part is that his bad luck doesn't end there. The crises continue, from taking a taxi ride that inadvertently costs the world's supply of crude oil, to being tormented by all sorts of demons and demon-hunters. And as much as Ataru wants to get rid of Lum, more often than not, she's the only one that can get him out of the predicaments that he finds himself in. This is Rumiko Takahashi's first ongoing series, and it shows. The art is becoming more and more dated, and the characters aren't nearly as well-developed by this point in the series as we see in Ranma 1/2 or Rin-Ne. Still, it is a series that helped shape the love triangle genre of manga and anime, and the stories are funny enough to keep the reader engaged. 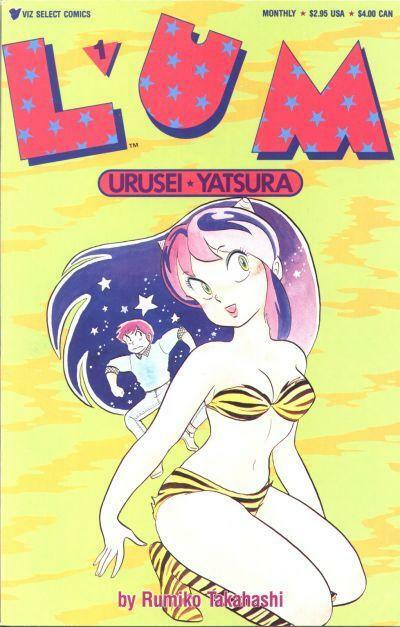 If Rumiko Takahashi or romantic comedies are your thing, might as well see where it all started.